Bobo Carpenter and his BU teammates enter the Beanpot on a five-game win streak. It’s an unsettling year for the Beanpot. The first two Mondays of February are routinely a showcase for some of the fiercest competition in college hockey, but the 66th annual battle for Boston bragging rights opens without any of the four teams ranked in the top 10 nationally. Indeed, Harvard, Boston College, Boston University, and Northeastern are all struggling to reach the cutoff point in the PairWise Rankings, which determine the NCAA Tournament seedings, with Northeastern the highest of the four at 14th. The Beanpot could be the beginning of an abbreviated trophy season for these perennial powers. That leaves a wide-open field when the ’Pot begins play Monday night at TD Garden with Northeastern taking on Boston College in the 5 p.m. opener. Boston University faces Harvard in the second game, a rematch of last year’s final. Anything can happen, as Harvard demonstrated last year by defeating BU, 6-3, to win its first title since 1993, the first time in 24 years a team other than BC or BU had won the title. The Crimson went on to win the Ivy League title, the ECAC regular-season and tournament titles, and reached the Frozen Four semifinals. All four coaches have played in the Beanpot and know what a championship in February can do for a team. 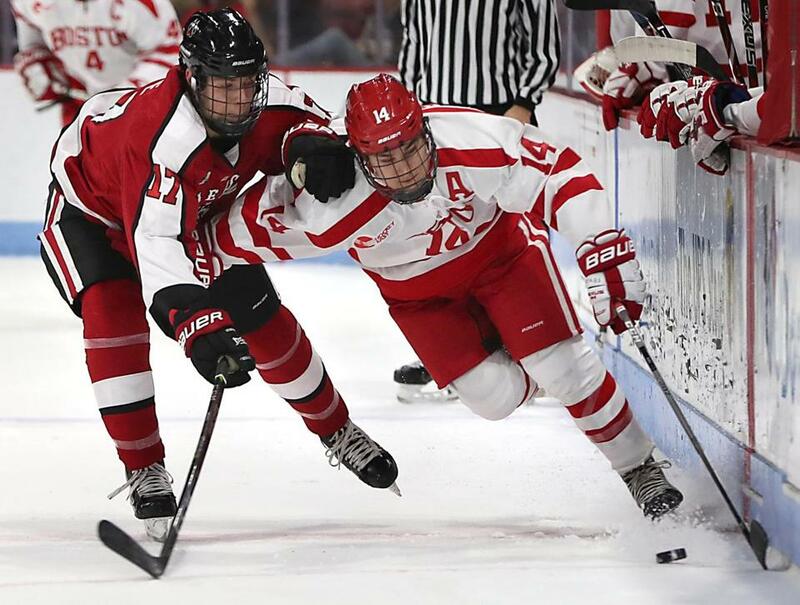 It’s hard to call Northeastern the favorite because it hasn’t won a Beanpot since 1988, but the Huskies have had a strong season (15-7-5, 11-5-3 Hockey East), and there is buzz on Huntington Avenue that this could be the year. Eleventh-ranked Northeastern has been riding the coattails of its high-scoring top line: Dylan Sikura (13 goals) Adam Gaudette (19 goals), and Nolan Stevens (17 goals), who have collected 102 points between them. The Huskies are tied for sixth in the nation at 3.41 goals per game, and their power play is sixth (25.81 percent). Freshman goalie Cayden Primeau is eighth in the nation with a 2.01 goals-against average. This season, the Huskies have split a pair of games with BC (13-11-3, 13-5-0 Hockey East), the only other ranked team in the Beanpot at No. 16. The NU offense was quiet in a 4-1 loss in November, but connected for four power-play goals in a 5-2 victory in December. Even with all that firepower, it is Northeastern’s defense that concerns BC coach Jerry York. NU’s team defense is ranked eighth in the nation with 2.26 goals against per game. BC has won six of the last eight Beanpots but had its first fourth-place finish since 1994 last year, losing to Northeastern in the consolation. The still-evolving Eagles strung together an early eight-game unbeaten streak but are 3-4-1 since Jan. 1. Goalie Joe Woll (2.74 GAA) has lots of international experience, but he’s playing behind a catch-as-catch-can offense. Graham McPhee leads the team with 11 goals while Julius Mattila has a team-best 20 points. The prospects for defending champion Harvard (10-8-4, 9-5-3 ECAC) are always harder to read because they play in a different conference than the other three. Their only game against a Beanpot team was a 4-4 tie with BC on Nov. 24. The Crimson lost six forwards from last year’s Frozen Four squad and have struggled to revitalize the offense. Junior Ryan Donato leads the team with a nation-best 21 goals, three times the total for Lewis Zerter-Gossage and Jack Badini, who are second on the team with seven each. But Donato will miss the tournament’s second round to play for the United States in the Olympics. Goalie Merrick Madsen, one of the heroes of last year’s postseason, has a 2.20 GAA. Boston University (14-11-2, 10-7-2 Hockey East) had a rough start, going 8-10-1 through December and failing to patch together consecutive wins. But the Terriers, who have won the Beanpot 30 times, are on a seven-game unbeaten streak, with five straight wins. They seem to have found their way to winning hockey at just the right time. Bobo Carpenter leads the team in scoring (16–11—27), with five others chipping in at least 21 points, including Jordan Greenway (9-15—24), who will miss the second round of the Beanpot to play in the Olympics. Like BC, BU has a goalie with international experience in Jake Oettinger (2.61 GAA). “The last couple of years we’ve come out with really good starts and this year has been a little bit of different start for us, a lot of freshmen, so it was a little bit of a feeling-out process,’’ said BU senior Brandon Hickey. “Since the break we’ve been kind of hitting our stride. It’s a really exciting room to be around right now.